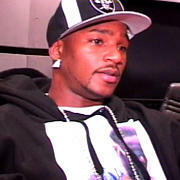 Da Greasy Guide: Worldwide: Rapper Cam'ron shot in DC! Superstar rapper Camron was shot three times in Washington, DC this morning (Oct. 23) sources have revealed to AllHipHop.com. The Harlem, New York native was leaving club H20 en-route to Love (formerly Dream) when three unknown gunmen approached the rapper. While details are sketchy, eyewitnesses said the men were seeking the rapper’s pricey Lamborghini, which he was driving while in town for a performance over the weekend. They were after that car, an eyewitness told AllHipHop.com. Cam refused to give it up and attempted to drive away and they shot up the car. Camron was struck three times and while officials have not released his actual status, sources said at least one bullet struck the rapper in the arm. His injures are allegedly not life threatening and the rapper was treated at Howard University Hospital. Juelz, Jim [Jones] and other Dip-Set members are with him at the hospital right now, the source said. Cam’ron, CEO of Diplomat Records, has been driving the blue Lamborghini since at least June of 2005. I bought the Lamborghini especially for New York, Camron told a 106 & Park audience prior to being arrested. Because we figure that we can only see stuff like this in Miami, but I am bringing it to the streets of New York. In July, police in Harlem stopped the rapper and arrested him while driving the Italian sports car for driving with a suspended license. Officials at Howard University Hospital declined comment and police did not comment at press time. Yahoo says the bullet went through both arms, how does that happen? Well depends on the speed of the bullet and if it missed his bones then it's possible to have gone through both arms. But again he was shot 3 times so he's lucky to be alive.